CHARLESTOWN NEVIS (September 30, 2010) — Clubs, organizations and businesses, last Saturday [September 25TH], participated in an islandwide cleanup as part of the Nevis Historical and Conservation Society’s [NHCS] 19th annual cleanup exercise. The International Ocean Conservancy Cleanup was organized by the society’s Biodiversity Committee and coordinated by Mrs. Miriam Knorr who expressed her satisfaction with the level of participation. In a preliminary interview with the Department of Information last week, Knorr said she had received assistance from every grocery store on the island in addition to some other businesses. 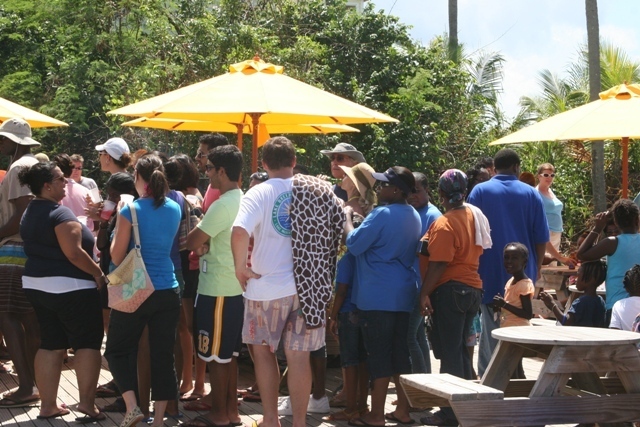 Following a morning of community development, the groups gathered on the deck of the Coconut Grove Restaurant where they were treated to a post-cleanup lunch. “We had everybody that we planned on. We have cleaned 30 sites in Nevis and we have over 340 volunteers: overwhelming response,” Knorr said. “In an effort to create more awareness,” according to Knorr, over the years, the society had gathered data based on the amount of litter collected. “This year was no different,” she said. “They fill out the data card which categorizes the kind of garbage and litter they pick up so we can say at the end of the day that maybe 20 percent was smoking related, was cigarette butts and lighters, or maybe a certain percentage was caused by dumping in ghauts or a certain percentage was caused by shoreline and recreational activities. So, it’s a scientific study as well as a basic cleanup and the third component, of course, is educating the public about keeping the beaches clean,” she said. While the community involvement in the cleanup exercise had improved, the amount of litter found on the beaches had escalated. Knorr added that although she enjoyed cleaning the beaches, she wanted persons to keep the island clean. “Pollution is the biggest problem that our ocean is being threatened with today and of course it is directly related to our health and our food supply as well as being an eyesore for people living in Nevis and for tourists coming here, so I think probably we can withdraw from this activity the day that we can walk down to the beach and see totally pristine beach, no garbage, then our work will be finished,” she said. Barbara Frazier of the Nevis Humane Society was among those who cleaned Tamarind Bay. Like others, she commended the effort of the organisers, particularly Mrs. Knorr, and said her main reason for joining the exercise was to improve the island’s appearance for potential visitors. “I thought they really needed help and there was a lot of trash to pick up and it looked horrible for visitors coming to the island to visit and see not only the coconut trees but the trash. I think everybody put forth a huge effort,” she said. The First Nevis Rainbow, Brownie, Guide and Ranger Unit turned out in its numbers dressed in Girl Guide paraphernalia as they cleaned Gallows Bay as one of their community service projects. Cleo Bartlette, who represented the unit, said that while the beach was more polluted than it was last year she believed it was as a result of the recent inclement weather conditions. “In terms of the stuff we collected, it’s a lot more: much, much, much, more than last year. We were hoping that it would get better but I guess we could contribute some of it to the water bringing up some of the litter that’s in the ocean from the storms that have passed recently,” she said. Mr. Loston Percival who is the president of Operation Future which, according to him, “rolls right into the Discovery Club,” journeyed from St. Kitts to be part of the exercise. 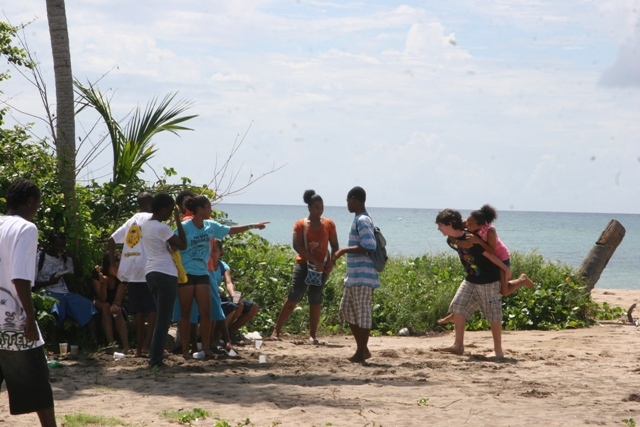 The Discovery Club started in the summer and has pledged to annually participate in the islandwide cleanup. Meanwhile, the Department of Information spoke with the newly appointed Executive Director of the NHCS Mrs. Evelyn Henville who believes that keeping Nevis clean must be based on a commitment of the entire community. “I need each one of us to pay close attention to how we discard of our rubbish and discard of our garbage. Try to become conscious of recycling and sorting the things that we purchase: sorting the paper, sorting the plastic, sorting the cans and take them to the Solid Waste Department and they will sort them properly,” Henville said. She added that the NHCS has plans of starting a recycling programme and she expects that the entire federation would be excited about the initiative. “We’re looking at involving our children, our schools, to see how they, from their age, can begin getting accustom to recycling and hopefully in the next 10 years we should have no problem with coastal cleanup being such a large project,” Henville said.